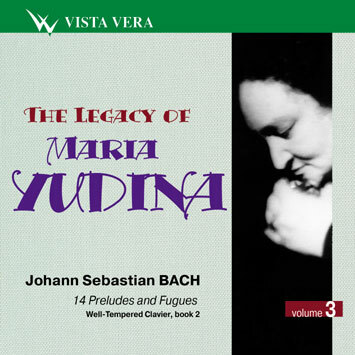 Maria Yudina apprehended Bach's music in the context of the Christian culture. When playing Bach she did not think about purely instrumental problems. Always the philosophical and musical sense played the main role. Maria Yudina was the artist of extremes (as Grigory Kogan described her), fervent and passionate, sometimes she shocked the audience by her bold interpretations that often went against traditional reading of classical music. Yudina reveals new sides of her talent. She displays a balance of emotions and intellect, very exceptionally austere and even ascetic selection of the expressive means. Yudina bows her head before the Genius, surrenders herself to his will while herself, as a subject, does not emphasize her presence. So what is so special in Yudina's interpretation of the preludes and fugues of the Well-Tempered Clavier? Yudina usually likes "to carve the image of the music by colliding two lumps, two images" But in this case, and it strikes most of all, she almost completely refuses to contrast preludes and fugues. Yudina does not change either the tempos or the dynamics or the nature of articulation (with the exception of the first two cycles, C major and C Minor). She interprets each prelude and fugue as a single whole with no conflicts. What is more, the whole cycle sounds like a single stream of consciousness. The listener finds himself (or herself) involved in and carried away by this musical development. However one can easily find that Yudina achieves that amazing integrity and fascinating uniformity of motion exactly by strongly changing tempos of individual pieces in one or another direction. The question arises, comparing with what does she change tempos? It is well known that Bach did not provide the scores with indication of tempos. So we have to say that Yudina changes tempos comparing with the Bach's metric symbols. Let's take for instance Prelude and Fugue No. 8 in D sharp minor and Prelude and Fugue No. 11 in F Major. In No 8 the Prelude written by 16ths (4/4) sounds unexpectedly slow and melodious. So the 8ths in Fugue turn out to be quite agile and make the music more energetic and yet stringent. The Prelude flows into the Fugue quite naturally. There's no contrast. In No 11 on the contrary the tranquil 8ths of the Prelude (with the measure of 3/2!) flow under Yudina's fingers like a light and fast stream. As result the triplet 16ths of the Fugue (the measure 6/16) sound virtually in the same tempo. So even if the Fugue charms the listeners by its liveliness and childish playfulness there is no usual contrast here. It's interesting, that Yudina escapes slow tempos (which she likes so much!) exactly where one would expect her to play slow. She plays two Fugues of typically chorale mould, No 7 and No 9, rather vigorously yet in a self-disciplined manner. It's more like a procession then a solemn chorale. There's one more important detail to mention. It's Yudina's sound. Maria Veniaminovna knew the secrets of extracting the sounds. She always impressed the listeners with the richness and diversity of soundings. But in this case she appears exceptionally moderate and strict in this respect. But this strict and precise and clear sound appears extremely expressive. Along with the uniformity of tempos and the dynamics it gives rise to the feeling that one hears the absolute music, "the music of spheres". These are only some distinctive features of Yudina's interpretations of Bach's Preludes and Fugues. On the whole it's very inspired, whole-hearted and profound performance. It opens for us some new sides of the pianist's individuality but also outlines some new avenues which the fantasy of a performer and listener may explore. Because, as Maria Yudina once said, "the approaching towards the comprehension of a musical composition is an infinite process".